In order to increase the mitochondrial density, you should target the body with enough stimulus in the form of mechanical stress so that you give it a reason to grow more mitochondria. In this article, we explain what you can do to increase the number of mitochondria and why it’s a goal worth pursuing. Mitochondria are your cells’ ‘power plants’. Their main function is to transform the nutrients we consume into energy, and they do that through the production of the ATP molecule (adenosine triphosphate). After producing it the cells use it to drive a multitude of body functions from breathing to movement and exercising. Without getting too scientific here and exploring cellular biology in details, it’s enough to understand that the mitochondria are absolutely essential to the energy metabolism, and because of this fact, they have a crucial role in the oxidation of fatty acids, which in plain English, means ‘fat loss’. For this to happen, fatty acids need to taken out from the fat deposits and transported to the mitochondria so that they can be oxidized and then used as an energy source. Considering that mitochondria are essential to the metabolism of fatty acids, it would also be logical to think that having more of them would be even better, wouldn’t it? Increasing the number of mitochondria, a process known as mitochondrial biogenesis takes the demand off of just 10 mitochondria and disperses the total workload among a hundred, which would enable them to do their job of transforming energy from fat into ATP to be used by the body more efficiently. There can actually be thousands of mitochondria in each cell and taking into account that our bodies have trillions of cells, that would add up to a lot of mitochondria. In any case, it doesn’t hurt to have more of them. If you want to increase your mitochondrial density, you need to give the body a reason to produce more of them. As with many other components of our bodies, if you don’t use them, you lose them. To put it differently, if the body has no need of them, it won’t produce them. We’ll take muscle tissue as an example. The body will not perform the highly energy-demanding task of building and maintaining new muscle tissue if you give it no reason to do so. The same way you start losing muscle mass when you stop working out, you start losing mitochondria when you stop giving them the reason to be there, which also results in a much less efficient fat loss. Ok, so now we know what mitochondria and why it’s good to increase their number. The next logical question is: what do we need to do in order to increase their number? Lucky for us, there are several studies that have examined this and gave conclusive results. Both strength and endurance training trigger an increased fatty acid oxidation capacity which directly correlates with increased mitochondrial density. The higher the energy demand by the muscles, the higher demand for the mitochondria to provide it. Low-volume high-intensity interval training (HIIT) also increases mitochondrial biogenesis. 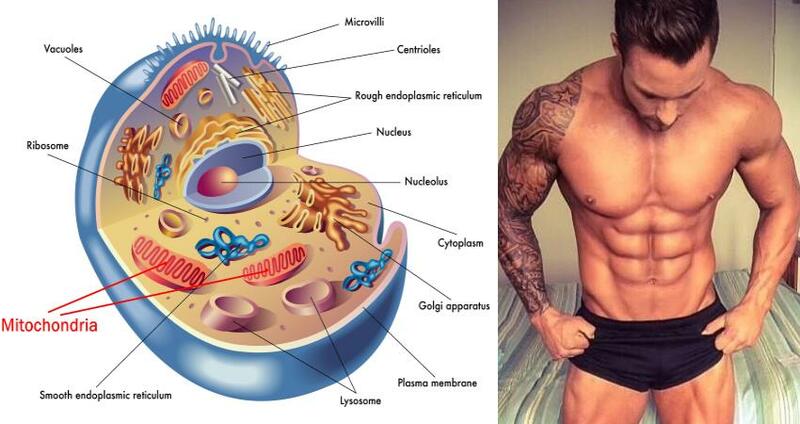 Within 24 hours of intense workout session, new mitochondria were being created. The intensity of your workout session and the energy demand it places on the muscles in one of the major triggers to increase mitochondrial density. A mix of both resistance and endurance training will cause a drastically higher rate of mitochondrial biogenesis than doing only endurance training. What are the main takeaway points of this study? If you want an efficient fat loss, include both resistance training and cardio exercises into your workout program. Even though one study defined cardio exercise as one hour of cycling at 65% of maximal oxygen consumption, it can be said that a combo of resistance training and HIIT is superior to resistance training and steady-state cardio in regards to increasing mitochondrial biogenesis. Supplementing with BCAAs (Branched-chain amino acids) was also shown to increase mitochondrial biogenesis in skeletal muscles. BCAAs are actually three of the nine essential amino acids for humans. These essential amino acids can’t be created by the human body and therefore must be consumed via your diet. Amino acids are the building blocks of protein and also the reason why protein is one of the three essential macro-nutrients. Consuming around 0.8-1 gram of protein per pounds of lean body weight is deemed enough for triggering biogenesis. As a summary, based on numerous studies, if your goal is to increase mitochondrial density and as a result increase the rate of fatty acid oxidation or fat loss, focus your training program around strength training and HIIT, and eat a diet which is rich in protein and low-glycemic carbs.